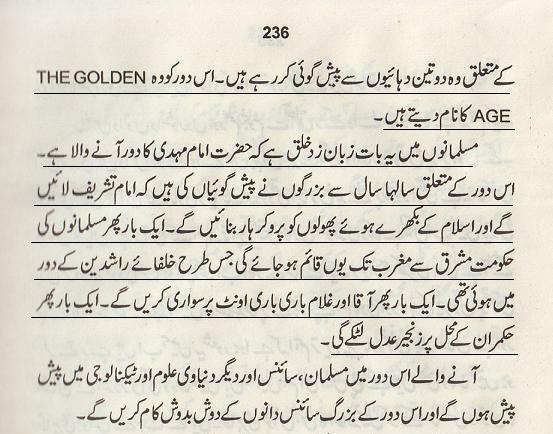 An important extract about Arrival of Golden Era and Imam Mehdi AS from Book 'Okhay Olrhay' written by Mumtaz Mufti is posted below. Book: Okhay Olrhay was first time published in 1993. English Translation is also added. Please read it carefully. Scientists, scholars and astrologers say that we are about to enter a century wherein strange events will occur. The research which once was limited to the realm of physical science is now changing its dimension. Scientists say that they have always kept our research horizontal, but now it is time that we alter this mode to vertical because we are now facing a wall ahead which warrants us to adopt a flexible approach to traverse it. Before that we have been researching the physical world, now we have come to know that matter is subservient to soul or spirit (mind over matter!). The attribute known as ESP (Extra Sensory Perception), is a characteristic which does not stem from known senses and cannot be discerned by sensory perception. They say that we have about 10 powers in us, and 9 out of which are lying dormant within our minds and spirits while we use only one of them in a limited fashion. In the coming century when man will be the subject of the science, we will know the truth of these powers. And when the era to utilize them comes, the lives will be entirely changed. We are still unable to understand the relation between soul/spirit and body; in fact the science has not even recognized the existence of soul/sprit yet. In the coming century we will be acquainted with spiritual powers, making us nearer to Allah and our Deen. Things that we deem to be supernatural or miraculous will be rendered quite natural; will end the slander of superstition upon religion. Astrologers of international level and clairvoyants say that heavens are now rife with strange accumulation of such stars and constellations which have never been seen before in the skies. They say that (according to their studies) a shining era is about to begin across the globe. The time of peace and tranquility; for which they have been predicting about for three decades. This epoch has been described by them as ‘The Golden Age’. Amongst the Muslims, the belief of the imminent arrival of Imam Mehdi (AS) is prevalent. For years, the saints have foretold his arrival and that he will unite the whole Ummah. Once again the Muslim rule will spread from East to West just like in the era of Khilafat e Rashida. Once again the servant and master will take turns in riding the camel. Once again the chain of justice will adorn the door of the ruler of Nation. In this era, Muslims will lead the drive of research in science and technology and the saints of that age will work hand in hand with the scientists. 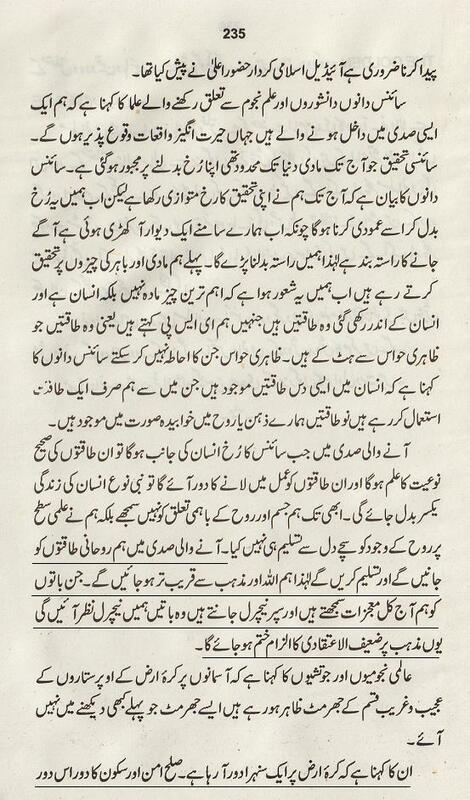 Note: Please read complete chapter about Syed Sarfraz A. Shah Sahib from same book. Search tag about Syed Sarfraz Shah Sahib and Mumtaz Mufti or go to 'Post by Authors' Menu Tab and find the article. Please appreciate brother Baktar e Noor for doing professional translation of this difficult extract. I hope, he will help me in future posts also. Now I have a time to start working on another blog site. InshaAllah I will let you know about that in coming days. i hope people denying and criticizing the "super natural Mahdi" and miraculous powers of Mahdi alaye hi salam will be reading this. and i'm sure that they'll come and defend themselves.Among them are those who deny the Miraculous powers of Nabi Kareem Salla'l la ho alaye hi wa ala aalihi wasallam either directly or indirectly,. InshaAllah next post will be also very important, I will post explanation of poem named 'Mehdi' by Allama Iqbal. We must understand what Allama Iqbal said about it. @"Scientists, scholars and astrologers say that we are about to enter a century wherein strange events will occur. The research which once was limited to the realm of physical science is now changing its dimension..."
"The fine-tuned universe is the proposition that the conditions that allow life in the Universe can only occur when certain universal fundamental physical constants lie within a very narrow range, so that if any of several fundamental constants were only slightly different the universe would be unlikely to be conducive to the establishment and development of matter, astronomical structures, elemental diversity, or life as it is presently understood. [Mark Isaak (ed.) (2005)]"
Atheist Scientist Richard Dawkins, who wrote many books against God and religions like 'God Delusion' and who is strong opponent of Harun Yahya, now come up new theory some Alien created life in this word as it is proved life is not created in world. He still doesn't believe on God but believe on Aliens. @"Before that we have been researching the physical world, now we have come to know that matter is subservient to soul or spirit (mind over matter!). The attribute known as ESP (Extra Sensory Perception),..."
Atheist don't talk about the soul as the soul cannot be explained in materialistic terms. 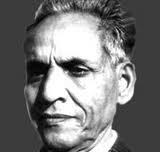 @"In the coming century when man will be the subject of the science, we will know the truth of these powers. And when the era to utilize them comes, the lives will be entirely changed..."
@"In this era, Muslims will lead the drive of research in science and technology and the saints of that age will work hand in hand with the scientists." Some believe science and technology will be finished by Imam Mahdi and will not be used during Golden Age. This is totally wrong. Only materialistic science and technologies will be finished like destructive weapons and artificial foods etc... People will use atomic energy not for weapons but for energy. @"Amongst the Muslims, the belief of the imminent arrival of Imam Mehdi (AS) is prevalent." @"This epoch has been described by them as ‘The Golden Age’." I would like to encourage all Muslims and specifically my Pakistani people to have patience and trust in Allah & Prophet Muhammad in this time of test. Because Allah is about to separate the truth from the lies which were spread by so called democratic elite of this world and please don't be judgmental in order to declare who can do what. I'm sure you all will agree with me on this point that Allah is protecting his beloved Messenger's Ummah, so have patience and don't be judgmental, Its best to monitor the situation and try to learn form it for our better and bright future. Insh Allah Allah will give us Khilafat soon as a bounty. Please remember all Muslim fellows in your duas.